Your commercial HVAC equipment requires proper care and maintenance. 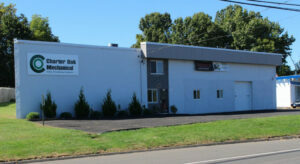 Charter Oak Mechanical of Manchester CT offers commercial heating and cooling services for businesses of all sizes. Scheduling your cooling maintenance off season gives your business the advantage by allowing time for repair. Additionally having your system serviced when air cooling is not needed spares your business the expense of emergency HVAC repair fees or the demand to temporarily closing your doors. Season after season if you have noticed your cooling system repair fees adding up it may be worth your consideration to invest in a new system. There are many energy saving, cost effective, options available for your cooling needs. To maintain a happy, healthy and productive work environment comfort is key. This year don't waste time by disrupting your work flow, stay ahead of the game by calling Charter Oak Mechanical for your HVAC needs.